E.A. Bakkum is professionally active in the Sociaal Consultatiekantoor, where he holds the position of solicitor. 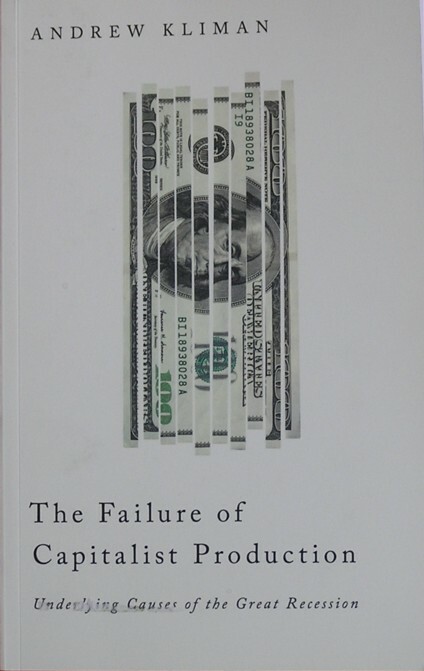 The Failure of Capitalist Production (2011, Pluto Press) is a special book, because Andrew Kliman is a special economist. Since decades he tries to rehabilitate the economic theory of Karl Marx, and in 2007 he revealed his arguments to a broad public with the appearance of the book Reclaiming Marx' Capital1. The discovery of Kliman and his associates is the Temporal Single System Interpretation (TSSI), which interprets the text of Marx's main work, Das Kapital, slightly different than is usual. The common interpretation of Das Kapital leads to the conclusion, that the presented theory is internally inconsistent. However, if one accepts the TSSI, than the theory of Marx appears to be completely defendable. Then the theory of labour value can be applied without problems, and even the illustrious law of the tendential fall in the rate of profit is simply valid. It would seem that the rehabilitation of the theory of Marx would strike the world like a bomb. In practice Kliman obtains recognition only in a small circle. There are at least three reasons why the TSSI is appreciated so poorly. In the first place, many admirers of Marx reject any marxist text, which does not originate from the master himself. This group consists of leftwing activists, who find the propagandist meaning of marxism more important than its actual correctitude. Secondly, economic scientists dislike the TSSI, because she casts doubt on ideas, that have been cherished for a century. In general, scientists appear to be surprisingly conservative. Here the problem is, that economic theories can hardly be falsified. Therefore the choice of a certain theory is more a matter of belief than of objective truths. And thirdly, it is the nature of Kliman to critically evaluate the work of his collegues, and in this process to promote empathically his own points of view. He even criticizes scientists, that could in principle be his allies. This fundamental approach is not appreciated by everybody, and augments the risk to be designated as querulous. In his latest book The Failure of Capitalist Production Andrew Kliman applies the TSSI to the crisis, that since 2008 shatters the global economy. In order to understand its content it helps to first read Reclaiming Marx' Capital, but it is not obligatory, because in his newest book Kliman explains the TSSI again, albeit only in general terms. The Failure of Capitalist Production is written in the same pleasant style, clarity and precision as the earlier publications of Kliman. Again he succeeds in baffling the reader, by energetically rejecting a number of common conceptions. It must be admitted: the books of Kliman are a joy to read, just because of his autonomic thinking. According to Kliman the global economy has never recovered itself form the recessions in the seventies and eighties of the last century. On the contrary, from then the downward development has continued. With this point of view he opposes nearly all economists, including the left ones, for they are convinced that the neoliberalism has restored the profitability of the enterprises. The Great Recession of 2008 did not come as a surprise to Kliman. Since in Kliman's view the profitability of the enterprises continues to fall, he believes that this explains the crisis of 2008. The real economy falls into neglect. So the fundamental problem is not the enormous expansion of the financial sector, as is often suggested. As a direct consequence of Kliman's preceding argument the wage rate (the ratio between the total wage sum and the GNP) has remained constant during the era of neoliberalism. Also in this aspect his view collides with those of his collegues. The core of Kliman's arguments, which as said are founded on the TSSI, concerns the definition of the profit rate. Other authors calculate the profit rate of the private enterprises in the wrong way, and thus obtain the false result, that the profit rate is rising since halfway the eighties. Their mistake is that they calculate the production costs on the basis of the prices, that prevail during the sale of the end products. These are called the replacement costs, and Kliman refers to the result as the profit rate at current costs. His critique of this calculation is that the production costs were incurred a considerable time before the end product is sold. Obviously the prices change in the course of time, and thus the calculation does not use the real costs. When the costs are wrong, then the resulting profit rate is no more good2. In fact the calculations should use the prices, that were valid at the moment that the costs (employment of labour, resources and capital goods) were made. Kliman calls this the historical costs. And thanks to the technological progress the labour productivity continues to grow, resulting in a structurally falling tendency of the (real) prices. Therefore the historical costs are always higher than the current costs. This explains why Kliman finds a falling profit rate, where mosts scientists observe a rise. Actually the mechanism occurs, that Marx has described: the stock of capital goods K expands, while the profit P remains behind, so that the profit rate r=P/K has to fall. Kliman, who only calculates the macroeconomic profit rate, divides in his processing of the statistical data the profit P by the K of the preceding year. The falling rate of profit does in itself not cause a crisis. However, the entrepreneurs try to restore their profit rate, and this causes speculations and the formation of debts. Thus instability is created, resulting in a speculation bubble and finally in the crisis. After the recession the profit rate can temporarilly rise again. It is interesting to note how Kliman describes the economic policy since halfway the eighties, in particular in the United States of America. The American government has tried to end the recession of the early eighties by means of fiscal instruments, such as tax reductions. This only increases the national debt. At the same time the interest rate was kept low with the purpose to stimulate new investments. This may be seen as an invitation to engage in risky speculations. Apparently Kliman believes that the policy boils down to asset-based keynesianism3, even though he does not use this expression. He describes how between 1994 and 2000 in the dot.com bubble the stock exchange quotations rise to a ridiculous level. From 1998 the American house prices double in value during the following eight years. Finally the speculation bubble makes the crisis inevitable. A consequence of the state support is that during the recession of the seventies and the eighties (as well as in possible following recessions) there is insufficient capital destruction (by means of bankruptcy) to restore the profitability. Kliman amply illustrates his description of the economic developments between 1945 and 2010 with long-term empirical time series4. They increase the value of the book. In addition Kliman refuses to engage in "cherry picking" (selective presentation of statistics), which is done by so many authors, and this deserves appreciation. He shows graphs of the time series, both for the profit rate against current costs and against historical costs, and discusses the differences between these two models5. Kliman underpins the stability of the wage rate by including all kinds of derived incomes into the rate, like pensions, unemployment benefits, social security and compensations for health costs. These kinds of compensation have increased considerably since the seventies, a fact that is disregarded by other scientists. A problem of the current economy is the growing sum of depreciations, because ICT products become obsolete very fast. This is caused by the rapid technological progress in ICT, such that within a few years the ICT products do not meet the current standards6. This phenomenon pushes up the size of the stock of capital goods. Kliman could have ended his book here, but he can not refrain from correcting another misunderstanding among economists. This misunderstanding concerns the theory of underconsumption, which is into vogue among marxists and leftwing keynesians. Kliman attacks especially the wellknown book Monopoly Capital of Baran and Sweezy7. Underconsumption implies that the workers obtain structurally insufficient income, and that consequently there is a lack of consumptive market demand. At the time several authors objected, that a shortage of consumptive demand can be compensated by an excess demand for capital goods. Also Baran and Sweezy seem to realize this, but nevertheless they maintain that in the long term a lack of consumptive demand is not tenable. Kliman rejects this argument, and repeats that technically spoken a fragile consumption can always be compensated by increased investments. He defends this point of view also in order to support his own theory of overaccumulation. A reviewer should restrain himself, but in this case a reaction seems appropriate. Economic theories suggest that the consumption per capita should be maximized. This principle can be abandonned, like Kliman proposes, but then the system will fall a prey to social dissatisfaction. This seems to be the opinion of Baran and Sweezy. It is for this reason, that the keynesian theories advocate the proportional growth. Kliman concludes from his own interpretations that the present capitalist system is not tenable. The state is forced to support the system-enterprises, and those will be tempted to act in an increasingly speculative manner. This will destabilize the system. Kliman thinks that regulation is always too late, and offers too many escape routes. Therefore he calls for a new social order8, although he abstains from concrete proposals. In a footnote on p.226 he writes: "By socialist economy I mean a democratically run communal economy in which people's ability to work is not a commodity and in which production and provision are oriented to the satisfaction of human beings' wants, not to the accumulation of ever-greater amounts of wealth-in-the-abstract (value). In order for economic activity to be reoriented in this manner, finance, money, exchange, and value would have to be eliminated"9. The preceding paragraphs shows, that I love to read the books of Kliman. His texts are always original and clear. However it is a problem that Kliman is eager to criticize the opinions of other scientists. The reader is forced to weigh the ideas of Kliman and the existing convictions, which is a complex endeavour. An example of this dilemma is the theory of underconsumption, where Kliman appears insensitive to the argument of social disorder10. But even if the stance of Kliman is rejected, then his book remains a monument for independent thinking.